This walk is really a walk of two halves. The first follows the spectacular rocky coast of Penwith, the far west of Cornwall with high granite cliffs and rocky coves. 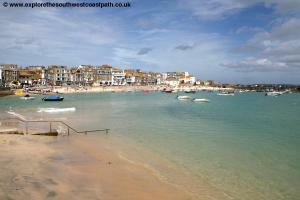 Soon you arrive in the beautiful town of St Ives (where the walk could be split if you prefer a shorter walk) and from here eastwards the character of the walk changes with the numerous sandy beaches of this wide sweeping bay being the main scenery. As an alternative you may prefer to park in Zennor near the start of the walk and travel by public transport to Zennor, then walk back to your car. If so the recommend place to park is the main park and ride car park at Lelant Saltings, which is well signed. Here there is a small parking charge and the park and ride is served by trains on the St Erth to St Ives railway line. 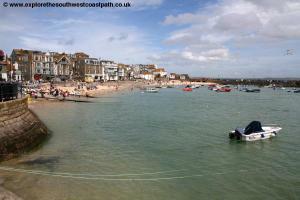 During the summer the trains run every 30 minutes into St Ives, taking around 10 minutes. 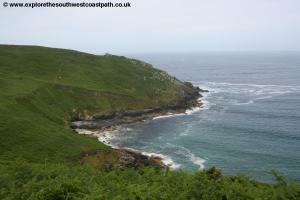 Due to it's remote location, accommodation in and around Zennor is limited. The Tinners Arms, the only pub in the village, offers bed and breakfast in an adjacent building. 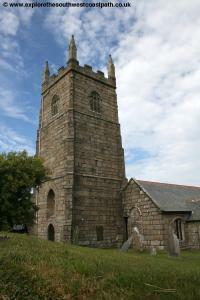 Tregeraint Houses also offers bed and breakfast in Zennor. 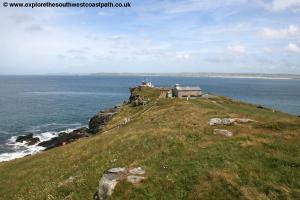 There is also an independant hostel, Zennor Backpackers that offers beds in shared dormitorys. 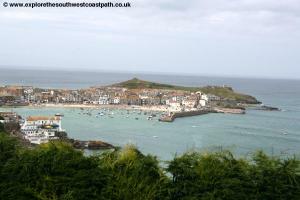 There is a wider range of accommodation available in and around St. Ives and St. Just. 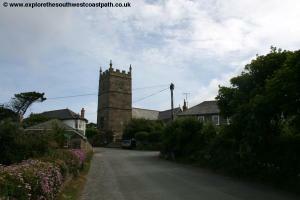 Zennor is a pretty little village in this remote corner of Cornwall and although small it does have a pub and church. From the centre of the village head up the hill towards the church (on your right hand side), which is well worth a visit if you can spare the time. Just past the church and with the Tinners Arms visible ahead of you turn left on a track (signed as Coast Path, with another sign for Field Path pointing to the right). This track twists and turns passing a small house on the right and a much large house on the left after. At this large house (marked as Carn Cobba on the map), continue straight on along the narrower footpath ahead, ignoring the part of the coast path signed off to the left ahead. 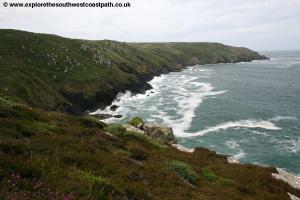 Soon the path begins to climb out to the rocky headland of Zennor Head and the path is soon surrounded by rocks, heather and gorse, a pattern than continues for much of the first part of the walk. 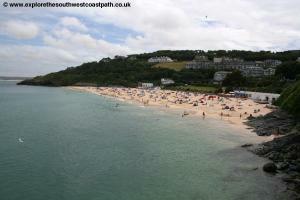 To the left you have Pendour Cove, a rocky cove with some sand at low tide. 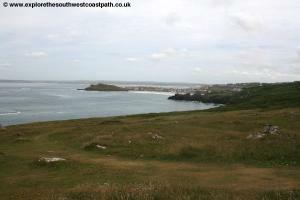 Continue on the path to the corner of this headland where the path turns to the right with the coast. 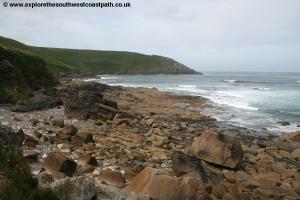 At the north east corner of the headland the path turns right again, still with the coast with the rocky and sandy cove of Porthzennor Cove ahead. 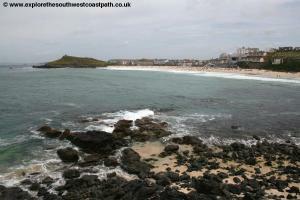 As you round the back of this beach, a zig-zag path off to the left leads down to the beach if you wish to explore further, although the coast path continues along the cliff top. At the eastern edge of the beach, another path joins from the right, but ignore this and continue straight on along the obvious cliff path. Unlike many parts of the South West coast path this part of the coast path is not the easiest to walk as it's mostly quite narrow (although also not very busy) and very rocky, a result of the terrain over which it passes, but you will find yourself needing to climb over rocks in place. 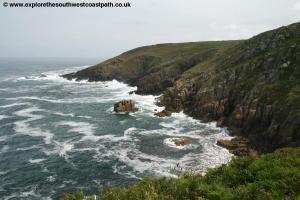 Keep to the obvious coast path ahead that soon descends into the rocky valley of Tremedda Cliff. Cross the stream and continue on the path up the other side along these initially low cliffs. The path hugs the edge of the cliffs around to Tregerthen Cliff where you have fine views of the rocky granite cliffs of Wicca Pool and Mussel Point ahead. 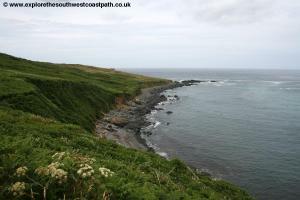 After rounding the headland the path descends to a rocky area where you keep to the main path that returns to the cliff edge although it's very rocky here. Take care here and generally as long as you keep close to the coast on your left you shouldn't go wrong. 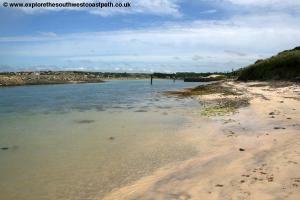 The path becomes more obvious and less rocky as you round Mussel Point. The path follows through a mixture of bracken and gorse as you pass behind the oddly named Economy Cove behind which there is a descent down to a rocky little valley and back up although it's not especially steep. Climbing up the other side the path soon goes around Trevega Cliff a little back from the cliff edge so views of the sea are a little more limited, but the is easy to follow. Soon the path returns to the cliff top above Brea Cove and continues eastwards, not going out onto the numerous little rocky headlands although this area is now classified as access land so you can walk out to the end if you want. You soon pass the the tiny cove of Polgassick Cove where there is some sand at low tide but there is no safe access to the beach. Beyond this beach the coast path cuts off the walk around Pen Enys Point although again the headland is access land if you choose to explore it. 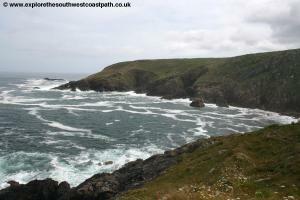 Continue on the main path east returning to the cliff top to the east of Pen Eyns Point at Zawn Quoits. 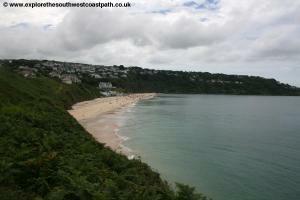 The eastern edge of this cove again has a small amount of sand at low tide but again has now safe access. Heading east from here the coast path again cuts off the next headland, Hor Point but as before you can go out to the end if you choose to. East from here you round another couple of small coves on the obvious coast path and then descend down to the grass covered Burthallan Cliff from where you now have fine views of St Ives ahead. 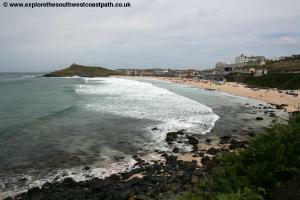 The main beach that can be seen is Porthmeor which is the main surfers beach and is backed by the Tate St Ives, a popular art gallery. 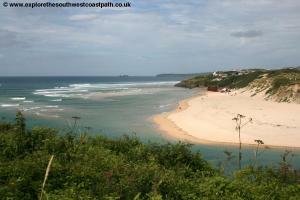 The path now sticks to the low cliffs until it joins the road, Beach Road which you follow along the back of the beach. Pass the small car park on the left and the large church yard on your right. The coast path now follows this road along the back of the beach, but a more pleasant route is to take the steps down from this small car park to the beach and walk along the shore line of the beach, where the sand is harder and easier to walk on. 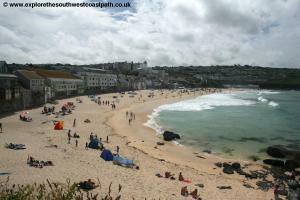 The round white-painted Tate St Ives can be seen behind the beach as St Ives is somethings of an artists community. It is famed for it's excellent quality of light and many artists studios can be seen in the town. If you keep to the road route just after the Tate St Ives the road curves round away from the cliff top, take the first left (Back Road West) and once you've joined this road take the next road on the left (Porthmeor Road) passing another slip way onto the beach on the left. If you've walked along the beach climb up this slipway at the east end of the beach to the road behind to re-join the main coast path. 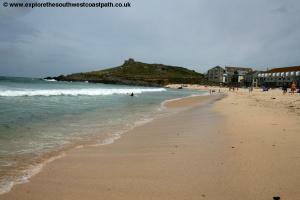 On reaching the car park turn left through it and then follow the low footpath around the headland, officially known as St Ives Head but normally referred to as "The Island". You can also climb to the little chapel at the top if you prefer. 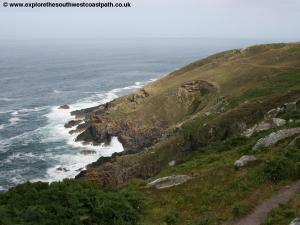 As you round the low path you come to the lookout station and from here follow the main tarmac path down to the car park behind Porthgwidden Beach. 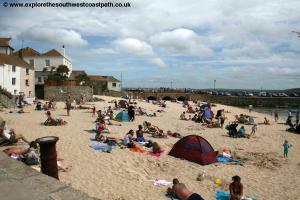 This is a small and sheltered east-facing beach backed by some beach huts and a cafe. 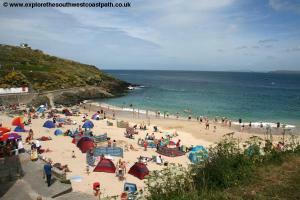 Pass through the car park and cross the slip road leading to the beach and enter another car park ahead keeping to the coastal side of the car park passing another rocky and sandy beach above the harbour. 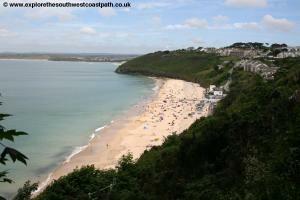 Keep to the minor road behind this beach that soon narrows to a cobbled track leading out to the pretty harbour. St Ives is my favorite town on the Cornwall coast path and from the harbour it's hard not to fall in love with this pretty town in such a beautiful setting. Follow the main path along the quay behind the harbour, usually filled with many brightly painted fishing boats and backed by a sandy beach (unusual for a harbour). All along this street are shops and cafes although you do have to watch the traffic a bit as it tries to make its way along the narrow road. 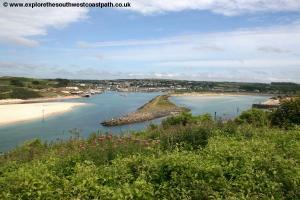 Continue around the harbour beside the road with the coast on your left and at the slipway at the south edge of the harbour where there is the lifeboat station you continue on this path with the lifeboat station on your left. The path here is pedestrianised once more and you pass public toilets on the left. Continue on this walkway behind the beach with houses on your right as ahead it becomes a road once more with houses on your left briefly blocking views of the sea. Soon this re-joins the road leading into the main car park above Porthminster Beach (the railway station can be found at the end of this car park). From opposite the station there are steps down to this fine beach, another beautiful sandy and sheltered beach popular with bathers and always busy if the weather is fine. 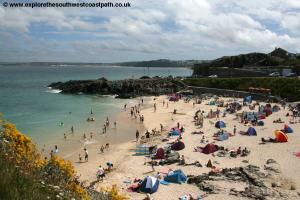 By the cafe, take the path along the grassy green behind the beach to Porthminster Cafe. Keep on the path behind the cafe (which should be on your left) as it soon zig-zags up the cliffs to cross over the railway line on a footbridge. Keep left on the surfaced wooded path behind the beach that soon emerges onto a residential road, Hain Walk which you follow with houses on both sides. This soon heads through woodland again and then you come to another bridge over the railway line on your left. Cross this and keep to the path that descends to the beach passing a hotel. 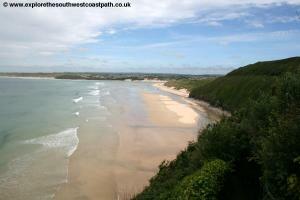 Carbis Bay is another wonderful sandy beach backed mostly be trees and bracken-covered cliffs it is a beautiful and sheltered beach. The settlement was largely created as a result of the Great Western Railway opening a station here and was actually named Carbis Bay after the station. From the small car park at the back of the beach follow beach road as it climbs up away from the beach with modern flats visible above you and to the right. Pass the road of Carrack Gladden on your right and shortly after the coast path leaves the road via the signed path to the left. The path follows the headland at Carrack Gladden (at low tide it is possible to wade round from Carbis Bay, as the sea is shallow here) and round the corner to Port Kidney Sands. 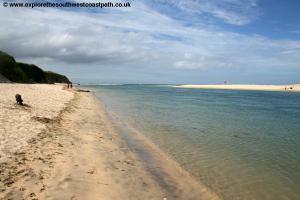 This beach is wonderful with a vast expanse of sand leading right round to the beach of Hayle Towns and Godrevey Lighthouse and island at the north end of the beach, although the river Hayle flows out along the centre of the beach. 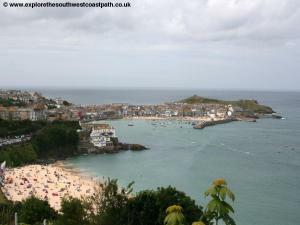 It is a wonderful view and this beach is a wonderful sandy beach and usually virtually deserted, even when the other beaches in St Ives are very busy. You now follow the obvious path around the houses and along the back of the beach with the railway line close by on your right hand side. The path soon drops to be among sand dunes still with the railway to your right. As the beach soon joins the edge of the Hayle Estuary the official route of the coast path is signed right over the little bridge over the railway line although in my opinion a better route is to continue along the wide and obvious path along the back of the dunes until you reach a few houses from where there are steps up, passing under the railway line to rejoin the official route. If you stick to the official route, cross the railway and immediately you have crossed turn right, the path that soon joins from the left is the one described above from the beach. You now turn away from the estuary heading to Lelant Church, across a golf course. On reaching the church continue past the church to the little parking area and then the road. On reaching the road, turn left and as the road forks turn left along Green Lane. Ignore the private road that forks off this to the left and continue on the public road. Ignore the road that joins from the right and keep on this road nearest the coast. 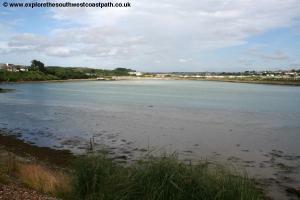 This is soon known as The Saltings and is next to the pretty estuary with the railway line to your left. Continue to Lelant Station on your left where the walk ends. Lelant Station is a request stop and if you are returning back to St Ives trains typically stop here only at peak times (and you must hail them to ensure they stop). If there is a wait for a train from here continue along the road for a around a third of a mile to Lelant Saltings station which is a park and ride and has a more frequent service. For Lelant village turn right up Station Road and on reaching the main road turn left. There is a bus stop a short distance along the road from where there are regular buses. If you are driving to this walk it is recommended to park in the morning at Lelant Saltings station and take the train to St Ives and then the bus from there to Zennor and walk back to your car. However if you prefer to do the walk the other way round, Lelant station where the walk ends consult the timetable. Lelant typically only has trains at peak times and they stop here only on request (you need to hale the train). If not continue along the road for around a third of a mile to Lelant Saltings station which has a more frequent service. It is worth noting that at times if a train does stop at Lelant it may NOT stop at Lelant Saltings so that's why it's worth checking the timetable before walking on to Lelant Saltings. In any case from one of these stations take the train back to St Ives (you can pay on the train) and on arrival at St Ives walk to the bus station (at the other end of the car park by Porthminster beach) and from there bus service 508, operated by Western Greyhound runs roughly once every two hours back to Zennor. In the summer an open-top coastal bus service also runs. For details of the bus and train services along the North Cornwall coast please see the link below. 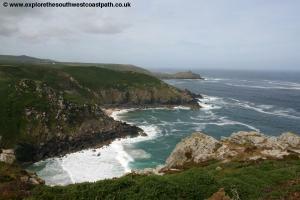 Streetmap is a web site which provides maps of the UK, including the area between Zennor and Lelant. 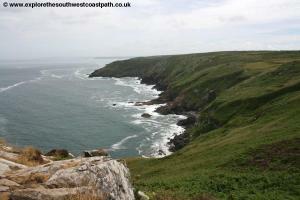 The links below cover the coast between Zennor and Lelant.